As a continuation of our effort to work our way through the entire Mr. Boston Official Bartender's Guide, and as a celebration of an absolutely flawless summer Saturday, today's drink is the glorious Gin and Tonic. Fill either a highball glass or a smaller rocks glass with ice cubes. Squeeze a lime wedge into the glass. Add 1 to 2 shots gin, depending on your preference. Fill glass the rest of the way with tonic water. What's so great about this drink (and what makes it much easier to make than its distant cousin the Gimlet), is that it can be made as weak or as strong as you like. Some people like their gin and tonics with a ratio of gin to tonic as much as 1:3 or even 1:1. No matter how you make it, the drink still tastes great. For example, if you were to use a smaller rocks glass with two shots of gin, you'd have about a 1:2 or 1:3 ratio of gin to tonic. 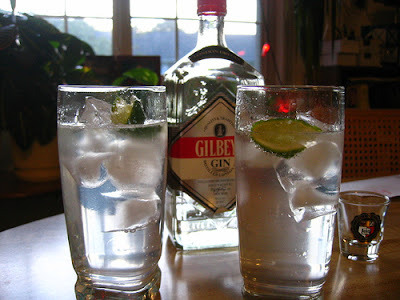 If you were to use a taller highball glass (holds 8-10 ounces) and one shot of gin, you'll have more like a 1:6 ratio. That's how we typically make ours--unless I've had a particularly bad day at work. Moreover, this is the PERFECT drink for a hot summer day. Somehow this drink quenches the thirst like no other. You didn't talk about one of the most important aspects of the "Gin and Tonic," namely, the brand of Gin used. I found that it can make a HUGE difference. (unlike vodka in mixed drinks which really should be flavorless). My gin of choice is Bombay Sapphire but Tanqueray works too, and I haven't really tried many to tell you the truth! That's a great idea for a future blog post--a systematic study of gin brands! That will REALLY ease the pain. Great article Mr. The Sieve, thank you! Apart from the quality of the gin, the brand of tonic water also makes a huge difference. Schweppes is head and shoulders over anything else. Is it true (or just a good story) that the combination of quinine (in tonic water) and gin arose in India during British rule ? I heard that the British soldiers who were given quinine as a cure for malaria took to adding gin to the very astringent-tasting quinine, as a means of making it more palatable. We bounce between Schweppes and Canada Dry, although I've found that the Canada Dry tends to go flat more quickly than the Schweppes--it's as if the plastic bottle they use is slightly gas-porous or something. I think you're right on the malaria issue. I've heard that too. I get a kick out of people who don't know much about gin but only drink the most expensive brands. If you want to really learn about the differences in gin and vodka quality then learn to drink martinis. Gordon's and Schweppes makes a perfectly good G&T and nearly half the price of Bombay Sapphire and Tanqueray. A suggestion is to rinse the ice quickly with water before makeing your G&T to remove any refrigerator odours from the ice. You're my kind of drinker. I've found I can't really tell all that much of a difference among gin brands, so I'd be a moron to pay up for the so-called good stuff.